Other photos on file from 1986, 1980, undated apparently recent, undated possibly 1979, and undated probably quite early. Also a photo of 3169 Klondike Road which may be by the same builder. See also "Presence of the Past" for September, 1987 [Nancy Saxberg] and January, 1990. Architectural Survey [Saucier 1985] and an earlier student narrative also on file. This tall red brick house on the west side of Main Street was designed and built around 1910 - 1911 by Tom Mills and his sons for the family of his son William. Tom Mills' other building credits include 6583 Main Street [q.v. ], the old North Gower Continuation School now demolished [6548 Main Street, picture on file], the carpentry in the 1905 Anglican Rectory [2368 Church Street, q.v. ], and possibly a house similar to the present example on the Klondike Road in Marlborough. This latter structure - 3169 Klondike Road - was apparently also built for William's family when they decided to move shortly after the present house was finished. The Marlborough house is also of red brick and a rather incongruous 37 datestone on it reads "Farmers Cottage: 1912." [photo on the present file]. There is however no direct evidence that Tom Mills built this house; the present  owner, Mrs. Molly O'Connor, notes that the name O'Connor [coincidentally] is scrawled on the basement cement and she suspects that this is the name of the builder or at least of the mason. 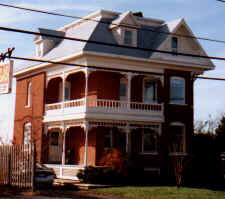 In any event, after William left North Gower the house on Main Street was rented for a short time and then another of Tom's sons, Fred Mills, moved in with his family of four boys and one girl. Fred Mills was originally a carpenter who worked with his father until sometime in the early 1900's, when he gave up carpentry to become a mechanic. He acquired the skills for his new occupation by taking apart a Model "T" Ford and then putting it back together again. He ran North Gower's first garage out of an old log building that was situated to the immediate north of the present  bank building, about where 6588 Main Street would be now. In 1926 Fred Mills bought land from Joseph McCurdy and erected the garage which still stands adjacent to the house. The old log building was torn down. Upon Fred Mills' death in 1953, his son Eldon and his family moved into the house. In 1961 Eldon Mills sold the house to Burton Harrison, who sold to his son Trevor in 1978. Trevor Harrison sold to Mark and Dennise Kelly in 1986. Originally, two 18 foot buildings ran straight back from the house, one serving as a woodshed and the other as a summer kitchen. Both buildings were mounted on stone piers and, although it is not entirely clear who demolished what, it appears that the Mills removed the single storey woodshed sometime in the 1950's. The two storey summer kitchen, closest to the house, was apparently being used as a woodshed when the Harrisons replaced it in 1980-1981 with a modern single storey shed. The bricks in the house are stamped "T.B." which indicates that they were made at the Taylor Brothers' brickworks on Lot 14 in the Broken Front concession of Marlborough. In the late 1980s the house was sympathetically restored by the Kellys. This is one of the larger and more elaborate houses in North Gower and is an important part of the main streetscape. It is a good example of the vernacular interpretation of the Queen Anne style and deserves to be preserved. Designation includes the front and side elevations. 37 incongruous because it is a large, substantial, two and a half storey house.